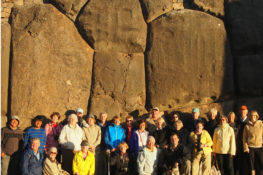 “We are a group of ‘seniors’ who love to travel, and are considering a South America destination for our next trip,” wrote Kathy when she first approached Knowmad. 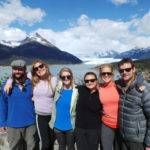 So, how is it that her group of adventurous ‘seniors’ ended up choosing Patagonia as one of the focal points of what eventually became a unique, 3-week trip to Argentina and Chile? Their route spanned from Buenos Aires to the jungles of Iguazú falls in Argentina and Brazil, down to the lush Bariloche area of Northern Patagonia, onward to the glaciers of Southern Patagonia, crossed through the Andes Mountains over to the jagged peaks of Chile’s Torres del Paine before ending in the Central Chile to explore bohemian ‘Valpo’, Santiago, and wine country. Read on to find out what makes Patagonia an outstanding destination for over 50 travel as well as for younger, adventurers alike. Surprising to some, Patagonia is an ideal destination for intrepid travelers over 50. Although many extreme technical rock climbing ascents have helped give fame to the area, there are countless excursion options, from wildlife viewing and light scenic walking, to full-day non-technical hiking routes on good trails with unimaginable views. Flexible, scalable excursions, world-class nature basecamps, and a unique gaucho culture are just a few reasons that Patagonia travel shouldn’t be overlooked by older travelers. Upon their group’s return stateside, (6 travelers in total) we asked Kathy and Mary a few questions to help describe some of the possibilities, challenges, and draws for Patagonia over 50 travelers. Knowmad: Why did your group choose to include Patagonia as a focal point of your trip? Mary: We chose Patagonia because of its beauty, and had seen pictures of it from a friend who is from Argentina. We had no concerns about going there since we love mountains and have been in the French and Swiss Alps. Knowmad: Was there any concern about Patagonia being a good destination choice? Would you recommend Patagonia to travelers over 60? Kathy: Although our group is all 70 years old or above, we didn’t really have concerns, especially after meeting with Knowmad and learning about options. We would absolutely recommend Patagonia to travelers over age 60. The scenery is unbelievably beautiful, breathtaking, and unique from other areas of the world we have been. Our trip was tailored to our group and abilities. The guides spent time with us, discussing the itinerary for the next few days, gathering input, then planned accordingly. It helps to be somewhat physically fit to participate in the hikes in Patagonia. One in our group has had some heart issues, I have mild asthma. We both were able to do the hikes, although one trip member didn’t go to the very top of one Patagonia hike. Otherwise, our group did every hike on the itinerary without difficulty. The guides were very sensitive to our abilities. Perhaps we went a bit slower, but certainly enjoyed each one. They were very appropriate for our abilities. Knowmad: Any tips you’d give other seniors planning trips to Argentina, Chile, and Patagonia? Kathy: The planning was very easy. Our group calls this “a trip of a lifetime,” one of the best we have done. It is an area of the world that is unique and beautiful. Give input to Knowmad and trust their staff to design a perfect combination of relaxation and adventure. The planning was very easy. We viewed the Knowmad trip options online. Jordan gathered input from the group and to narrow our choices. 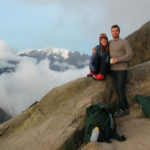 He proposed an itinerary, we reviewed and made very few changes. It was perfect. Knowmad: What surprised you most about Patagonia, Southern or Northern? Did you have a favorite excursion on your trip, and if so can you describe briefly? Mary: Every excursion that we took was great, but discovering the history and nature on Day 8 in Bariloche was exceptional, and Fede, the guide, was also. He was so informative and fun. The gourmet picnic lunch on the shore of Lake Nahuel Huapi on Day 9 was a once-in-a-lifetime memory, also. Kathy: A highlight of our trip was the time at the Patagonia Camp. Staying in the yurts with the nighttime view of the stars was incredible. The food and wine, the staff at the camp were also amazing. Knowmad: Is there anything else in general you’d care to add about your trip? 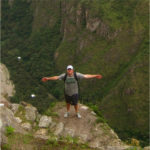 Kathy: I encourage anyone to explore the wonders of South America with Knowmad Adventures. Our trip was perfectly planned and every detail was taken care of. We were met at airports, taken to our accommodations, picked up for each excursion, then back to the airport with pre-printed boarding passes, guided through check-in, and directed to our departure gate. Unbelievable service. It was a stress-free trip and amazing from start to finish. Hopefully this is helpful to you and other travelers. A million thanks to Kathy and Mary for sharing those great suggestions for how to plan an exceptional Argentina, Chile, and Patagonia trip for travelers over 50, and for the inspiring feedback. And thanks to you all: Knowmad would not be Knowmad without our amazing community of adventure advocates! Do you want to travel to Argentina, Chile, and Patagonia, or learn about the wide variety of destinations and excursions perfect for over-60 travelers? We’re regional experts here at Knowmad Adventures and pride ourselves in building custom trips that are a perfect fit for our travelers. If you’re interested in crafting an adventure to Argentina, Chile, and Patagonia, don’t hesitate to reach out to our Trip Specialists at 612-394-2894 or travel@knowmadadventures.com to begin planning your trip today! Upon your early morning arrival, you will be met at the airport by a Knowmad Adventures guide and transferred to your accommodations. Enjoy the day independently exploring the sights of the wonderful city of Buenos Aires. Highlights that you could explore include: the tree-lined streets and parks of Palermo, artists’ studios in La Boca, Art Nouveau and French architecture, antique markets, South America’s broadest Avenue, the Obelisco, or the opulent cemetery of Eva Perón’s resting place. Enjoy the day at your leisure independently enjoying the sights and sounds of the vibrant city of Buenos Aires. In the evening, experience one of Buenos Aires’ most emblematic cultural highlights: tango. Born from the mixture of African, gaucho and European roots deep in the rioplatense culture going back to the mid 1800s, tango has developed in a complex mix of art and a true expression of the Argentine point of view on life. You will be picked up at 8:30 pm from your accommodations by a private transfer, and the Esquina Carlos Gardel Dinner & Tango Show will offer a spectacular demonstration of the finest local dancing accompanied by delicious Argentine specialty cuisine and a selected wine list. Enjoy your meal as you experience the development of tango throughout the century in an intimate venue, with nearly 25 professional tango dancers, singers, and orchestra members on stage throughout the evening. At the end of the evening you will be taken back to your accommodations. society. Included in this exploration will be a visit and guided tour of Teatro Colón, an iconic site in Buenos Aires that is consistently rated one of the best Opera houses in the world. Soak in the unique architecture, beautiful plazas and colorful culture of this famed city. After this exploration you can choose to continue exploring on your own, or can be transferred back by your guide and vehicle to your accommodations in the artsy neighborhood of Palermo. Today you will be picked up by your guide and transferred to the airport in accordance with your onward flight to Iguazú Falls. Upon arrival, you will be met by a Knowmad Adventures guide and transferred to your accommodations. Enjoy a relaxing afternoon immersed in the Paraná rainforest, perhaps reading a book by the pool, chatting on your private balcony with friends, or enjoying a drink next to the fireplace. After breakfast you will be picked up by your guide and be taken for a full-day exploration of the Argentine side of Iguazú Falls. Enjoy the Visitors Center showing the importance and biodiversity of the subtropical humid forest, and enjoy the panoramic views on a variety of walkways near and around the falls as your guide also shows you the endless assortment of plants and flowers. Today you will embark on the adventure-filled La Gran Aventura for an engaging drive through the jungle & safari boat ride that takes you right up to the mighty falls (please note this excursion is in small group basis). You’ll begin your journey to the falls on an approximately 20-minute truck ride through the jungle, where your bilingual guides will describe the local flora and fauna. After your short drive to Puerto Macuco, you’ll don life jackets and head out in a boat on the Iguazú River toward the falls. Take in the marvelous cascades as you glide past some of the shorter falls and stop to take a few surreal pictures. Prepare to get wet as you get even closer to the larger falls, your exceptional vantage point placing you so close you’ll want to bring a set of dry clothes for after the excursion! After a few trips around the 3 Musketeers area, you’ll dock at the San Martín Island to continue to admire these unforgettable waterfalls from land. Even by Argentina standards – a country full of natural wonders – the Iguazú Falls, are an extraordinary sight. It is said that Eleanor Roosevelt exclaimed, ‘Poor Niagara!’ when she saw the broad, tranquil river tumbling into the immense chasm of the Devil’s Gorge (Garganta del Diablo), surrounded by the emerald colors of the subtropical rain forest below. Departing in the morning, you will go with your guide across the border into Brazil and enjoy the views from the other side of the falls. Please remember to have your passport and Brazil visa with you for this excursion. From this side of the Argentine/Brazilian border, you will enjoy a panoramic, postcard view of more than 270 waterfalls, in all their majesty. Here, the Iguazú River flows within a deep horseshoe shaped canyon and the views can be admired from a panoramic elevator and lookout point, experiencing the roaring thunder and majestic exuberance of the falls. After your visit you will be transferred back to your accommodations for a relaxing afternoon at your leisure. In the morning you will be met at your accommodations by your guide and transferred to the airport in accordance with your onward flights. You will first fly from Iguazú to Aeroparque airport in Buenos Aires, where you will be independently responsible for catching your connecting flight to Bariloche. Upon arrival in the Bariloche airport you will be met by your guide and transferred to your accommodations overlooking Lake Nahuel Huapi. Perhaps explore the charming city center, where you will find alpine-style architecture and can sample the treats that gave Bariloche its reputation as the Chocolate Capital of Argentina. transferred back to your accommodations. In the morning you will be met at your accommodations by a private transfer to discover the most remote and least-visited branch of the Lake Nahuel Huapi: Brazo Tristeza. Sail along this impressive glacier fjord surrounded by beautiful mountains and gorgeous scenery. Once you reach the end of the lake, start a beautiful light interpretive hike through the native forest among amazing trees like coihues and alerces, as well as visit a nearby waterfall on the Frey River, a place of great beauty. Enjoy a gourmet picnic lunch on the shore of the lake as your guide shares more of the legends and natural history of the area. After lunch you will return by boat across the lake to the pier, and from there be transferred back to your accommodations to enjoy the late afternoon at your leisure. drink in the on-site Glaciobar, where everything is made of ice. the estancia. In the late afternoon you will be transferred from the hacienda back to your accommodations in Calafate. After breakfast, you will be picked up at your accommodations by your guide and taken to the Perito Moreno Glacier. The massive glacier wall that descends into Lake Argentino is 35-kilometers long and 70-meters (230 ft.) high. You will be in awe as you admire the glacier’s vibrant colors ranging from white to turquoise. You will spend the day visiting the various scenic overlooks and viewpoint areas around the sprawling Perito Moreno Glacier. Here you will be able to witness the ice detachment phenomena and hear the hollow sounds of ice falling and transforming into smaller floating glaciers. 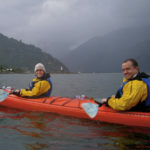 This day also includes an hour-long boat ride along the face of the glacier for an up-close-and-personal experience (please note that the boat excursion is in group basis), and you will also enjoy a delicious box lunch. After your day at the glacier you will be transferred back to your accommodations for an evening at your leisure. landscapes on the scenic ride. While at Patagonia Camp you will be able to choose from a range of adventurous excursions, as well as enjoy gourmet food and a range of wines from the award-winning Matetic Vineyards and alcohol as part of your adventure inclusive package. Enjoy beautiful views of Lake Toro from your camp, nestled in a native coigüe forest. Excursion highlights at Patagonia Camp include a variety of hikes throughout the region and in Torres del Paine National Park, kayaking in the private reserve, and fishing. There are also a couple activities such as horseback riding that have additional costs if choosing them. Your onsite guides will explain the multitude of options upon arrival, as well as aid you each night in planning out your activities for the next day. Continue enjoying your adventures throughout the region and your stay at Patagonia Camp. afternoon is yours to spend independently at your leisure. Perhaps visit the main square and touch the Tierra del Fuego statue for good luck, or make the short hike to the Cerro de la Cruz to look out over Punta Arenas and the Magellan Strait. Today you will be picked up at your accommodations to visit the penguin colony on Isla Magdalena (Spanish speaking driver only). Please note, as this is a shared guest transfer picking up other travelers at other hotels as well, the pickup time is approximate. Please be ready and waiting in the lobby, and please have your luggage packed and with you, as you will not be returning to the hotel after your excursion. 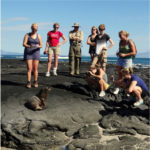 Isla Magdalena transfers and excursions are in small group basis. After a short drive, you will head to the pier to board your vessel and begin sailing through the Magellan Strait towards Isla Magdalena, a natural monument protecting more than 120,000 penguins as well as a small colony of sea lions. During your trip, you might possibly spot Austral dolphins and toninas overas, or Commerson’s dolphins. Upon arrival at the island, you will have approximately one hour to explore and photograph your up-close experience with the wildlife. When your time at Isla Magdalena has concluded, enjoy the fresh air and watch for marine life as you are returned to Punta Arenas on the approximately 2-hour return boat ride. Upon arrival at the pier you will be taken by shared guest transfer to the nearby Punta Arenas airport in accordance with your onward flight to Santiago. Upon arrival in Santiago you will be met at the airport by your Knowmad Adventures guide and be transferred to your accommodations in the centrally located historic neighborhood of El Centro. Today your guide will meet you at your accommodations and lead you on a privately guided exploration featuring Santiago’s most important historic and cultural sites. You will begin at the beautiful park on Santa Lucía Hill, and nearby you will continue on to the governmental seat of Palacio La Moneda, the House of Justice, and the National Parliament. Along Plaza de Armas, the main square, you will visit the Cathedral and view the majestic architecture of the Post Office and governmental buildings. Enjoy sightseeing and people watching in this city that has been bustling with life from colonial times to present day. A stop at the Pre-Columbian Museum will give you a glimpse at the art and artifacts of indigenous cultures from Mesoamerica, the Amazon, the Caribbean, and the Central and Southern Andes. Additionally, a visit to the Museum of Memory and Human Rights, which is dedicated to commemorating the victims of the Pinochet dictatorship, can immerse you further into the storied past of the country. At the end of your excursion you can choose to continue exploring the city independently or be dropped off at your accommodations to enjoy the rest of the day at your leisure. In the morning you will be met at your accommodations in Santiago by your guide and be driven approximately 90 minutes west to the coastal city of Valparaíso, declared a UNESCO World Heritage site in 2003 for its architectural and cultural significance. Valparaíso’s picturesque layout, enhanced by the surrounding hills that dive into the ocean, remind us that it was once the most important South American seaport of the Pacific coast before the Panama Canal was opened in 1914. You will visit both the downtown and the colorful hill neighborhoods of ‘Valpo’ where century-old hillside ascensores (elevators) rise up into the city’s steep hills and a labyrinthine maze of streets reveals brightly colored buildings, bohemian cafes, elegant restaurants and spectacular views of the harbor below. After exploring the city, you will head toward the Casablanca Valley and visit one of the most unique wineries in the valley, Bodega Re, where the family- run winery focuses on combining ancient ways of production with today’s knowledge to produce beautiful premium wines. Here you will enjoy a tour, as well as a lunch with a tasting of their distinct varieties. After enjoying the scenery of the vineyard you will be taken back to your accommodations to enjoy the evening at your leisure. accommodations by your guide and be transferred to the airport in accordance with your international overnight flight home.